Complete Basement Tapes - New Joyride Media Radio Special coming Oct 2014! 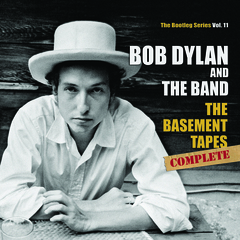 * COMPLETE BASEMENT TAPES - coming soon! In 1967, Bob Dylan and several members of what became The Band got together in upstate New York. For months, they played and played – and recorded as they went along. It took 8 years for some of the music to come out officially, but in that time, the legend of The Basement Tapes grew. Bootlegs were passed around, little hints of the bigger treasure that existed somewhere. In this one hour radio special, you’ll hear about these recordings from The Band member Garth Hudson, songwriter and author Sid Griffin, Dylan biographer Clinton Heylin, author Greil Marcus, writer Anthony DeCurtis and producer Steve Berkowitz, plus many highlights from the full release of The Basement Tapes. In: "What went on in '65, nobody will ever believe it who believes it today..."
Out: "I'm Rita Houston, and you're listening to Bob Dylan: Live at the Newport Folk Festival." In: "Welcome back to Bob Dylan: Live at the Newport Folk Festival. Out: "I'm Rita Houston, and thanks for listening." In: "What went on in '65, it's all been hashed out, the evidence is in, and it's ambiguous. Bob must be very happy." Out: "I'm Rita Houston, and welcome to Bob Dylan: Live at the Newport Folk Festival."